VE-807 Gauge Amplifier system is made from high grade quality materials to provide your production team with a reliable and accurate tool . It is used in conjuction with your mechanical fixturing system utilizing a multi-input probe sensors either Analogue or Digital . The 12 inch colour TFT active matrix display includes a touchscreen interface to ensure ease of use by production personnel. 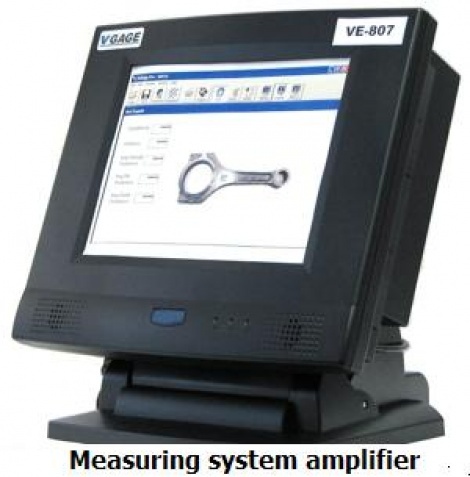 Pentium based industrial PC includes Windows XP software with custom VGAGE Pro8 software can be made to suit your component inspection requirement . On screen gauge measurements can be displayed with the high resolution colour LCD monitor in normal Bargraph realtime or customer designed . You can show either a photo image or bitmap or CAD drawing of the component on screen .